I have a problem. I'm addicted to sweets. Ok, wait - that's not really a problem. I mean, I don't mind my sugar cravings. I do, however, mind them when I get a craving and can't fix it...that's the worst! I help prevent this problem by baking treats on the weekends to get me through the week. I've been really into cookies lately but decided to change it up this weekend. Cupcakes have always held a special place in my heart. Growing up, I loved the Funfetti boxed mix - so yummy! I'd like to say that my tastes have matured a bit, now that I'm older. CRUMBS in New York City is absolutely delicious, as well as Red Velvet Cupcakery down in Washington D.C. I must admit...I've actually only had red velvet cupcakes at both! They're just divine. Anyway, I knew I wanted to make cupcakes, and there was a recipe for brown sugar cupcakes that I've had bookmarked for a while. 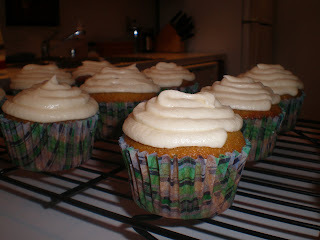 These are wonderful - and the vanilla buttercream frosting was absolutely perfect on top. I don't have any icing gadgets, so I just put the buttercream in a ziploc bag, and frosted the cupcakes with that - had no problems at all. Preheat oven to 350 degrees. Beat butter on high until soft, about 30 seconds. Add sugar. Beat on medium-high until light and fluffy, about 3 minutes. Add eggs one at a time, beat for 30 seconds after each. In a separate bowl, whisk together flour, baking powder, baking soda, and salt. Measure out milk and vanilla together - I used a liquid measuring cup. Add about a fourth of the flour to the butter/sugar mixture and beat to combine. Add about one third the milk/vanilla mixture and beat until combined. Repeat above, alternating flour and milk and ending with the flour mixture. Place baking cups into muffin pan. Fill with batter - 3/4 of the way full. Bake for 20 minutes until golden and the cake springs back when lightly touched. Yield: 12 cupcakes. 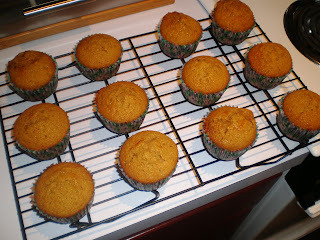 *I cut this recipe in half - and still had more than enough to frost 12 cupcakes.